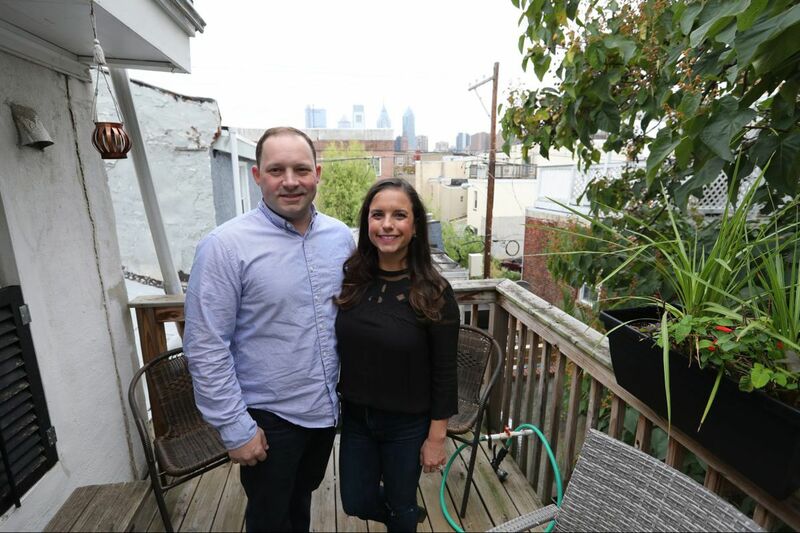 Homeowners Emily Kubick and Mitch Marino say they enjoy gazing at stars or Philadelphia’s skyscrapers from the deck of their Graduate Hospital neighborhood trinity. Emily Kubick and Mitch Marino were pretty sure they wanted to purchase a home in the Graduate Hospital neighborhood, where they'd been happily settled for two years. They had come to love being near some of the city's best urban action and a quick walk to public transportation. So, in 2014, when they toured a trinity for sale on a side street with quaint character and tidy window boxes, the couple jumped on it. "We would take walks in the evening and pick out houses we imagined living in," says Kubick, a buyer for Destination Maternity. "Then a real estate friend suggested we go take a look at this one." Besides its coveted location and good bones, the mauve-brick rowhouse, built in 1920, got extra bonus points for having had a makeover a few years earlier. The trinity Emily Kubick and Mitch Marino found in Philadelphia’s Graduate Hospital neighborhood. The couple weren't starting from scratch; they had an assemblage of contents from prior apartments. But since acquiring their home, they've added new and salvaged finds to complete their look, which they say is a combination of urban/animal/eclectic styling. "Emily, especially, is good at sneaking little things in here and there," says Marino, who is a territory sales manager for IRadimed, a supplier of MRI equipment. After they moved in, one of the first orders of business was to change the previous owner's Eurostyle wall choices. "There was a lot of lime green and electric blue," Kubick says. They chose a calming eggshell blue for most of the interior, which makes the oak flooring stand out. Unlike many rowhouses, the main floor has a more open profile, though it's intimate in scale. To create a sense of a living room, they placed two stone-gray chairs from West Elm and their cream-and-taupe sofa into a semicircle just off the entry. "We probably like this area the most. It's where we relax and can hang out," Kubick says. The curtains, sewn by a coworker of Kubick's, are a colorful counterpoint to the neutral furniture. The West Elm wood-and-metal coffee table and matching credenza lend some rustic detailing. Hanging nearby is a fun aerial shot by photographer Gray Malin called Coogee Wave, depicting hundreds of bathers that resemble a combination of points and patterns. The couple, who married in August, both attended Abington Heights High School in Clarks Summit, Pa., when Emily was a freshman, and Mitch a senior, but they never knew each other. They are both from nearby Scranton and met six years later through friends when they were home visiting. Both animal lovers, the homeowners describe their style as urban/animal/eclectic. Both are animal lovers — they have two cats, Chester and Grayson — and around the home they've incorporated animal fixtures and elements such as a golden pig that Marino bought for Kubick and a print of a tuxedoed leopard wearing an eye patch that had belonged to the previous owner. Knowing that the couple had admired it, she surprised them by sending it as a housewarming gift. Situated just outside the kitchen are an Ikea white round dining table and matching chairs, left by the previous owner. A fabulous addition is the powder room with yellow-and-silver floral metallic wallpaper, which the homeowners were going to rip down. "But then it started to grow on us," says Marino. In the kitchen, white cabinets and brownish granite countertops continue the seamless look. Kubick says they intend to install a backsplash of white subway tiles. On the second level, the couple created an office that doubles as a guest room. A shelf of collectibles there includes Marino's six catsup bottles, tokens from his first job at Kraft Heinz in Pittsburgh. Another guest room includes a bench from HomeGoods and bureaus from when Kubick lived in New York City. The third-floor master suite has a romantic, retro vibe. The bathroom has a marble-topped double-sink vanity, a large tiled shower, and a floor of tiny black-and-white octagonal tiles. The bedroom has a sea-green highboy and gray bureau found on Craigslist, and a charcoal velvet headboard. Another of their favorite spots is the deck, a place for gazing at either the stars or the city's skyscrapers. The owners say their home is a gem, but even more, their neighbors exemplify a combination of hospitality and pride. "Last spring, we were able to get to know more people when everyone was outside planting flowers," says Kubick. "I see us staying here for a while." The living room has plenty of room for the couple’s collectibles, including a golden pig that Marino bought for Kubick.